Jane Russell | 50 Westerns From The 50s. Pre-50s Westerns DVD/Blu-Ray News #254: The Outlaw (1943). Walter Huston listens to (or pretends to) producer/director Howard Hughes. Going in, The Outlaw (1943) had so much going for it. Howard Hughes and Gregg Toland behind the camera. A cast that boasted Thomas Mitchell, Walter Huston and the great Joe Sawyer, working from a script Ben Hecht worked on. And all set to music by Victor Young. 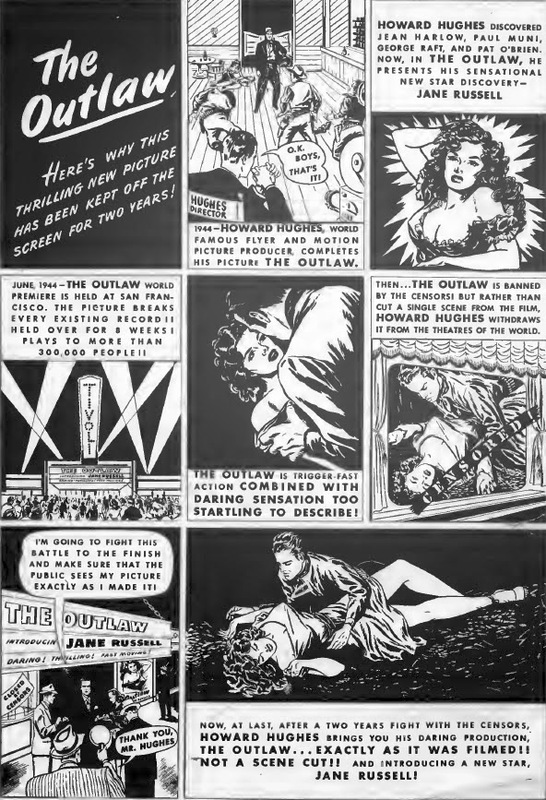 In the end, The Outlaw is known more for the crazy brassiere Hughes designed for Jane Russell (that she says she didn’t wear) and its trouble with the censors than anything else. 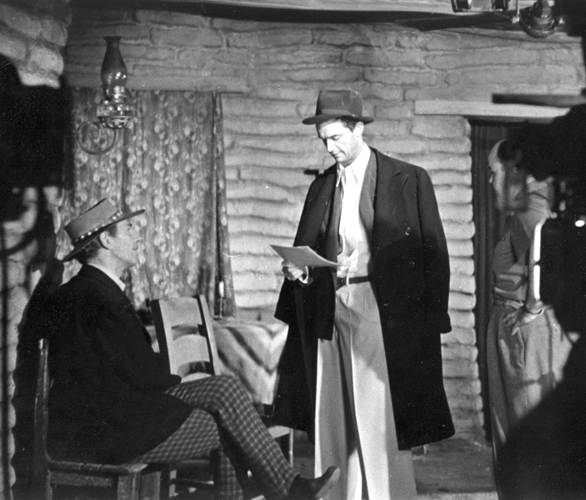 There are times when everything clicks — writing, acting, direction, cinematography — and The Outlaw shows real promise. If Howard Hughes had left things to Howard Hawks, we might have an extra great Western on our hands. Kino Lorber is bringing a spiffed-up (2K restoration) The Outlaw to DVD and Blu-Ray in February. I’m really looking forward to it — this is a film I’ve been meaning to revisit for quite a while. There’s been some debate out there as to whether this counts as a 50s Western, and some have said they don’t care for comedy Westerns in general. 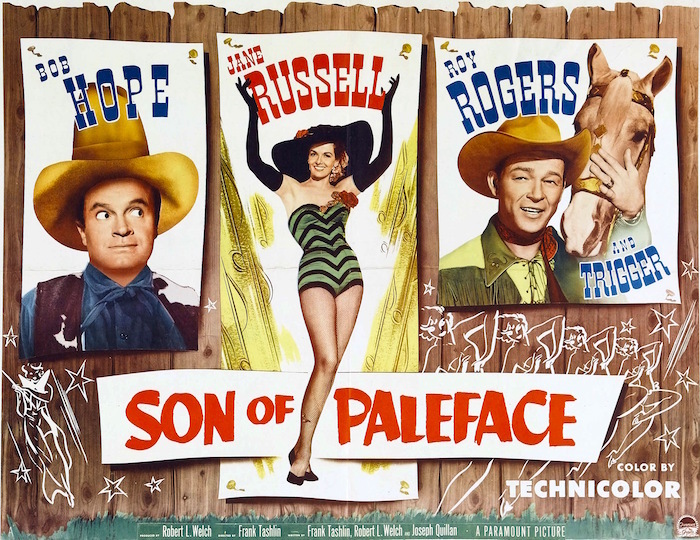 But for me, Son Of Paleface (1952) is one of my all-time favorite films. This was once available on the old HD DVD discs. Remember those? Now it’s coming to Blu-Ray this Summer from Kino Lorber, along with The Lemon Drop Kid (1951) and a couple of the Hope-Crosby Road pictures, Road To Rio (1947) and Road To Bali (1952). It’s all good stuff. About Time To Revisit Son Of Paleface (1952). 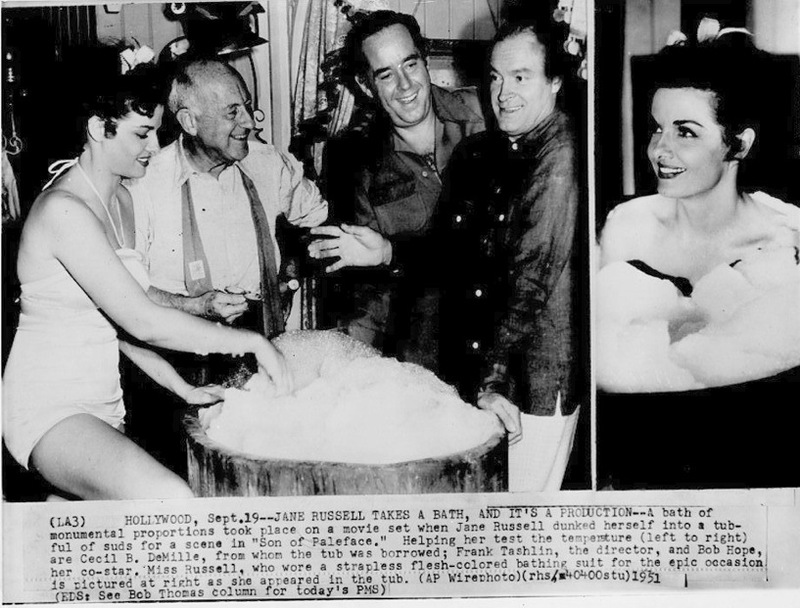 Here’s a cool AP photo from 1951, chronicling Jane Russell’s tub scene in Son Of Paleface (1952). Click it and it gets bigger. He’s not a cowboy star. 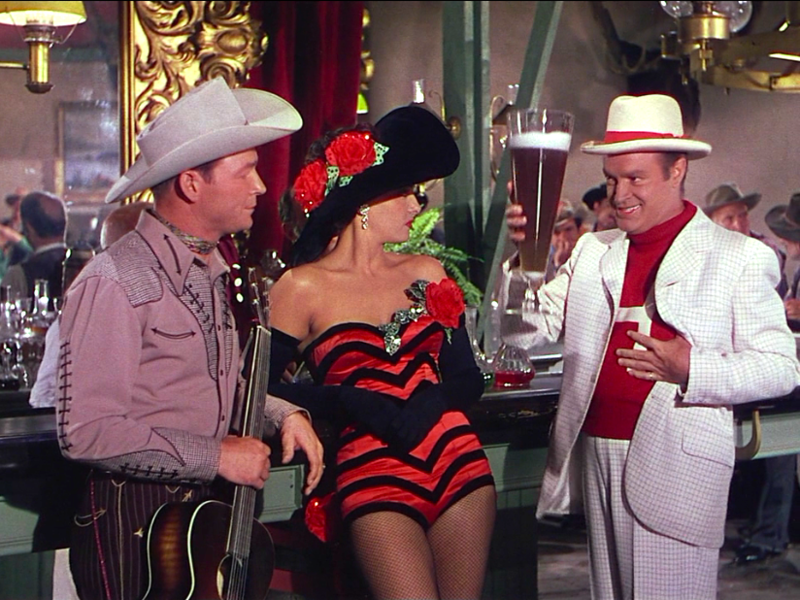 But his Son Of Paleface (1952) — directed by Frank Tashlin and co-starring Jane Russell and Roy Rogers (and Trigger, seen here) — is not only one of the best Western spoofs, but I’d hold it up as a strong contender for Funniest Movie Ever Made. Bob Hope would be 110 today. And while most of those TV specials are wretched, his movies of the 40s and 50s are terrific and ripe for re-evaluation. OK, now I gotta watch Son Of Paleface. Today would’ve been writer-director-genius Frank Tashlin’s 100th birthday. 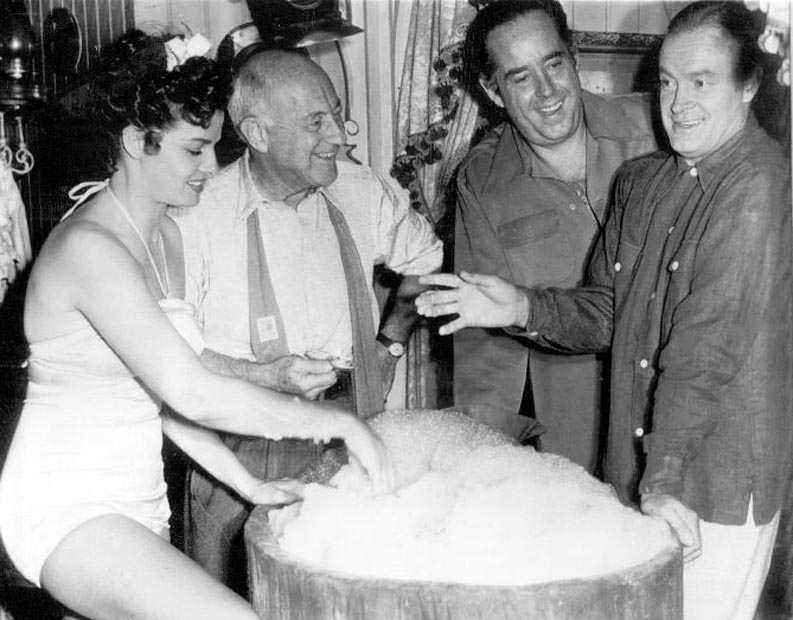 Here he is (second from right) on the set of Son Of Paleface (1952) with Jane Russell, Cecil B. DeMille (who has a cameo in this scene) and Bob Hope. 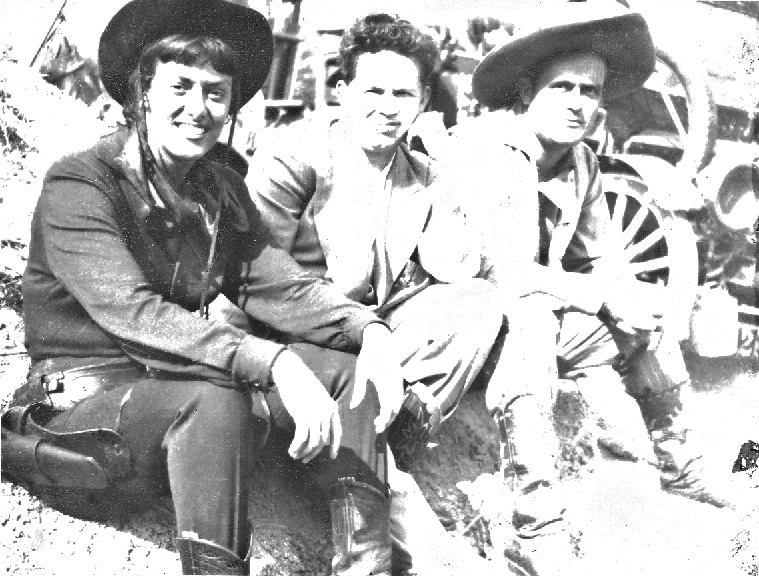 A number of people have written in to say they don’t like comedy Westerns (or is it Western comedies?). But every so often, I have to pay tribute to this film. 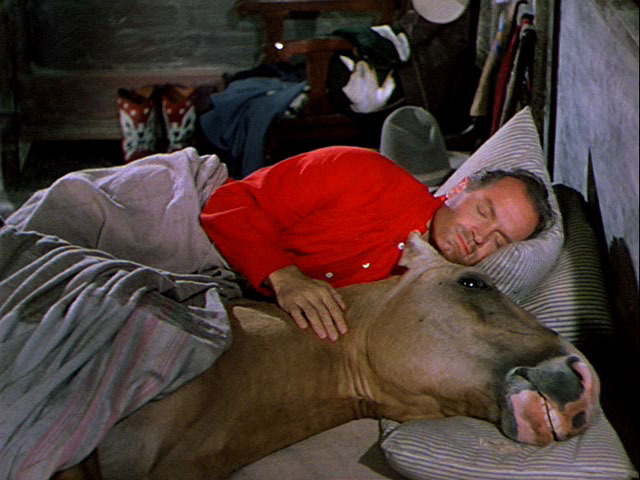 It’s hysterically funny, Roy Rogers is terrific in it, and Ivan likes it as much as I do. One of my favorites. Gallery: Making Son Of Paleface (1952). 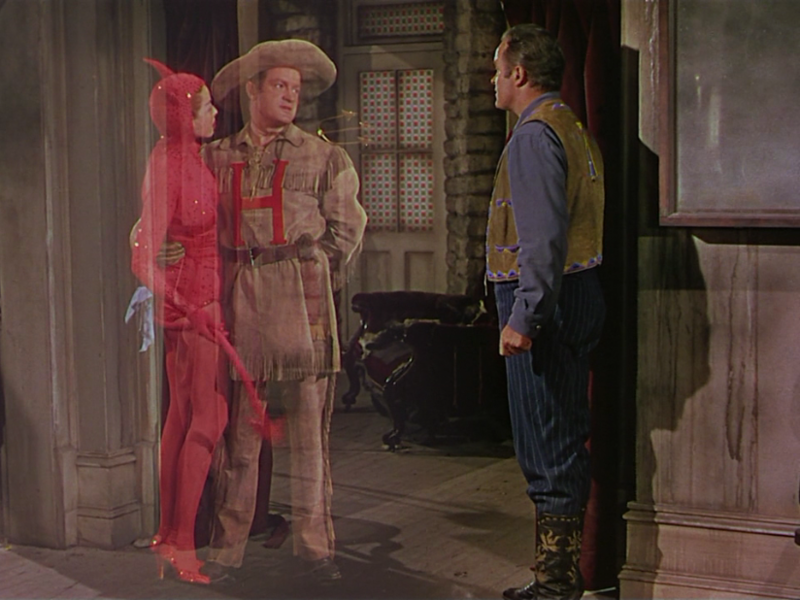 Took a stroll through my image folder on Son Of Paleface (1952), and a gallery seemed like a good idea. Here’s an incredible signed still. I’ve amassed so many images over the last few years, it seems like a real shame not to post them, especially the behind-the-scenes shots. Watch for more from other films. Here, Cecil B. DeMille (waiting to shoot his cameo), Frank Tashlin and Bob Hope (obscured) look on as Jane Russell’s bubbles are strategically arranged. 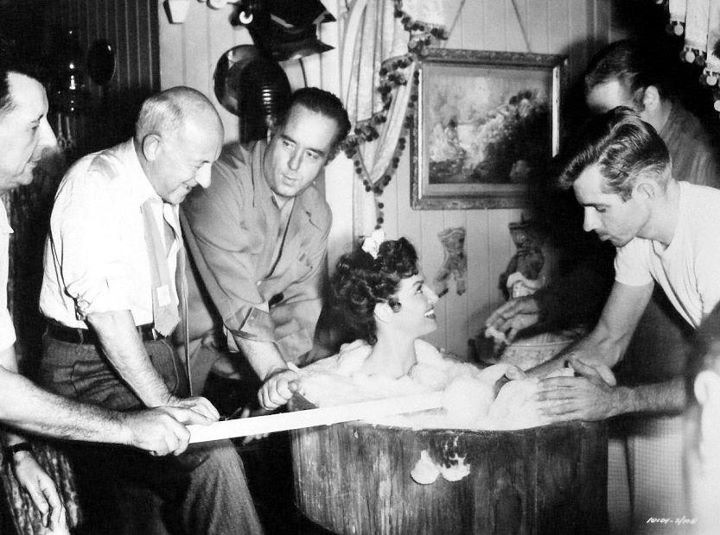 Jane Russell: “I even took a bath in the same tub Paulette Goddard had once used.” The tub was a leftover from DeMille’s Unconquered (1947). 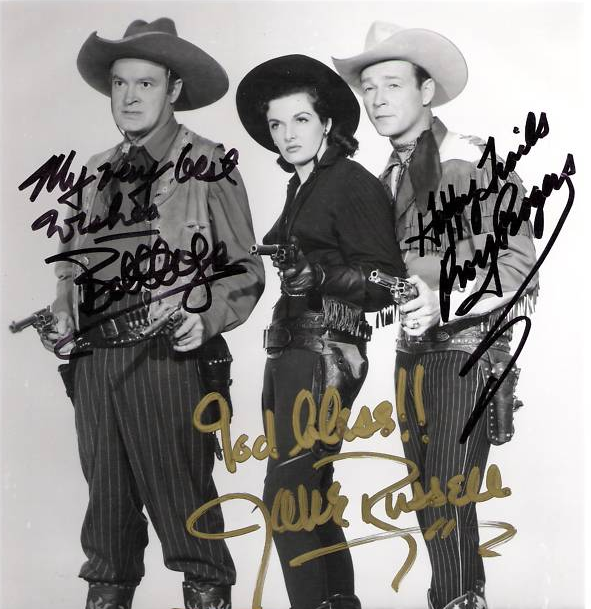 In a goofy promo shot, Jane and Bob help Roy feed Trigger. Here’s makeup artist Charlie Gemora with doubles for Jane and Bob. Note Junior’s car in the background (complete with wagon wheels). Photo courtesy charliegemora.com. 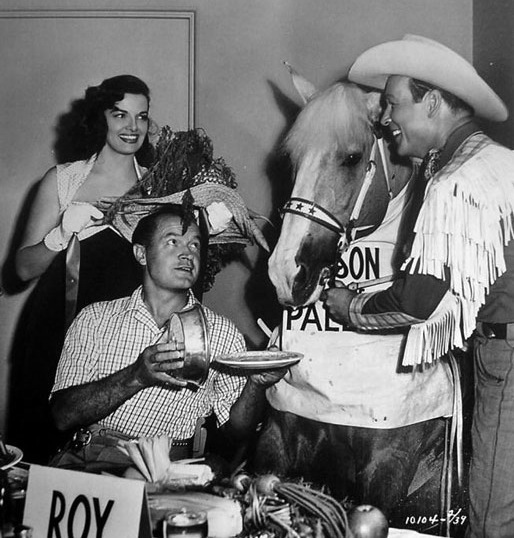 In Son Of Paleface (1952), Junior Potter (Bob Hope) downs a fiendish concoction called a Horse’s Neck at the Dirty Shame Saloon — as Jane Russell and Roy Rogers look on. Not sure what Roy had. Maybe it was the mocktail named in his honor. Instructions: Fill a 12-ounce highball glass with ice and add the cola and grenadine. Stir gently with a cocktail spoon or straw to combine. Garnish with the maraschino cherries and serve. It’s not much more than a fancy cherry Coke. But it sure is good. While we’re on the subject of Son Of Paleface, here’s another photo. And as Ivan over at Thrilling Days Of Yesteryear knows, that H don’t stand for Harvard.